A simple technology that can save millions of gallons of water in areas that are parched and barren for most of the year is what captured Simon Maddrell’s h eart. He left the corporate world in search of a way to help people — who sometimes had to walk 12 hours a day to find enough water to make one meal. Meanwhile, the younger children would be left at home without schooling, and the livestock were uncared for during these absences. The land area would be almost useless for agricultural purposes because of the arid conditions. In 1984, Maddrell met Joshua Mukusya whose passion and desire to find a way to have access to clean water for himself and his neighbors, started an investigation into techniques used during the colonial period, which slowed down water flow. Noticing how much green vegetation those areas had, he started working on plans to enlarge … (Read The Full Story). 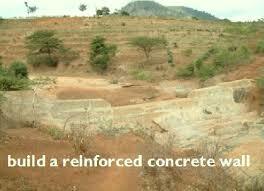 This entry was posted in Be a Social Entrepreneur, POSTS, WRITING and tagged arid, desert, drought, Joshua Mukusya, reinforced concrete wall, Sand Dam Man, Sand Dams, seasonal dry river bed, Simon Maddrell, water capture, water conservation, water retention walls, water shortages, water-barren conditions. Bookmark the permalink.